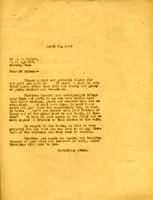 James Nevin writes to Martha Berry that he is assembling a book on Georgia women and wishes to include her in the book. He asks that if she would send a studio photo of herself to the book. 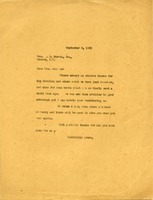 Letter from Martha Berry to Mrs. H. Morris, Jr.
Letter from Martha Berry to Mrs. H. Morris, Jr. thanking her for the donation of clothing, shoes and books. 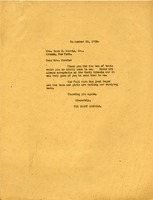 This is a letter from The Berry Schools thanking Mrs. Dave H. Morris Jr. for a donation of books. 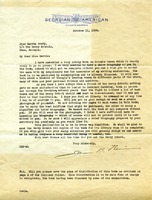 Letter inquires about some books sent by Mrs Morris, if they were received and if they are useful. 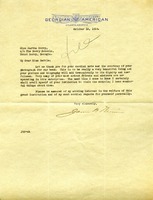 Carrie H. Hale encloses a contribution to purchase library books listed in the summer issue of the Southern Highlander. She offers a gift book and periodical subscription. 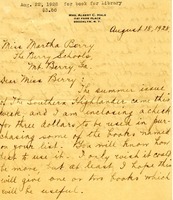 Berry writes to thank Haines for the gift, to provide an update regarding the schools, and to respond that she would be grateful to receive a donation of books, as most of the students are "very fond of reading." Mr Haines encloses a $500 check and asks Miss Berry if Berry would like some books and if fiction would be acceptable. 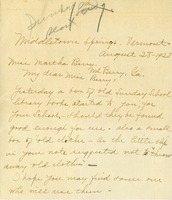 A letter from Martha Berry to C. P. Greble asking for a list of books so that Berry can decide which books that the school needs. 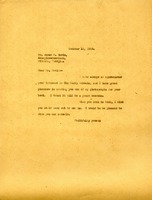 Thomas K. Gale asks Martha Berry if she received the nine volumes of the American Encyclopedia he sent to her. 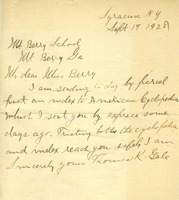 Thomas Gale writes to Martha Berry informing her he has sent by parcel an index to the American Cyclopedia he had previously sent. 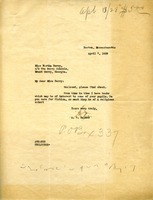 A letter sent to Martha Berry from a public library in Jersey City. 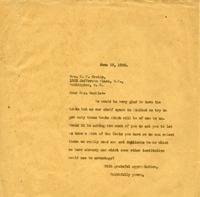 The letter informs her that a box of books was being sent for her to use in her school.